I love the movie 'Monty Python and the Holy Grail'. Not a day goes by I don't think of a line from that goofy film. I know, it's old and moldy and came out in the 70's, and the first time I saw it, I wasn't impressed. In fact, I think I fell asleep. But then when our boys were in grade school in the 80's we watched it as a family one night and they really enjoyed it and so did I. And as I grow older, I draw parallels between the film and my life more and more. In case you're wondering what the film is about, it's Monty Python's Flying Circus cast portraying the tale of Sir Arthur and the Knights of the Round Table and their comedic search for Camelot and the Holy Grail. Many a day starts with me flinging open the curtains in the morning, stretching painfully and asking myself, "What.... is your Quest?" Sir Lancelot had an easy question at the Bridge of Death. Lucky guy. But that's because he wasn't afraid. Well, I don't have a Holy Grail to locate, but you may remember that I'm on a quest to walk a lot. Well, at least five miles a day and maybe more if I have the time, but anyway, I am still doing that. Walking, I mean. I gave up the questing part, I have no time for Quests because I have to walk. I still walk even though my Polar Bear MD told me that the walking isn't doing me much good since my body apparently got used to walking five miles last year already so now five miles means nothing to it. Stupid body. Remember she told me I should be walking ten to fifteen miles a day? Well, what if I did (yeah, I know, Fat Chance) but seriously, what if I did get used to walking fifteen miles a day? What then? Well, I'm sure her answer would be to walk twenty or twenty-five miles a day. Sound reasonable? So yes, come to think of it, I am on Quest because I still haven't found a new doctor yet. I've been putting it off because, frankly, like Sir Robin, I'm a bit scared of what the new doctor might be like. And I just paid off the last hospital bill. But I'm running out of time and need to get the ol' thyroid levels checked again in the next two months. So I guess I have to get over myself and start Questing for a new MD despite the fear of soiling my armor if he/she turns out to be a Silly Sot or a Killer Rabbit with Nasty, Sharp, Pointy Teeth guarding the Cave of Wellness again. But anyway, back to my walks....I put on at least five miles a day but to be fair to my former, crabby MD, they're not all aerobic steps since I wear a pedometer which tracks my steps as I do gardening, laundry, shopping, housework etc. I guess the only steps that really count are the aerobic ones, so I'm fooling myself and need to get out on the road and really walk fast to achieve any fitness. Unfortunately, I have had problems with the local dogs around here and their truly stupid owners that don't control them. What I do to avoid dog problems is walk one-half mile west and then one-half mile east, one half- mile west, one half- mile east, you got it, back and forth, back and forth, back and forth which equals Boring. If I walk from our house past the windmill to the trail I mow out in the Back Eight and back home, it is exactly one mile around my homemade track. That works, too, but the grass is often wet in the morning when I have the time, so I stick to the blacktop road for the most part. And now, for something Completely Different, another trip down Memory Lane. When I was a little kid, I loved horses. I was completely fixated on them when at five years old we were visiting my cousin's farm and an older neighbor girl came over with a pony and led the horse with me on board around the yard. That was the first time I had ridden a horse and I was hooked. Though we lived on a farm, my father had no use for a 'hay burner' around and had sold the work horses right before I was born, so I was out of luck. Mom took pity on my plight and for Christmas one year bought me the next best thing, a Stick Horse. (Do they make them anymore?) Mine had a rather realistic face and was a Palomino I named (what else?) Trigger. Do you remember Roy Rogers and his trusty Palomino named Trigger? I loved that show, didn't care about the plot, just wanted to watch Trigger go through all his steps and do all his tricks. Oh, to own a horse like Trigger for reals! And in a way, I did, because my Trigger was very obedient and completely trained to do anything I asked of him. Such a horse. And I had such an imagination. The farm lane became the Wild West, the rock pile (parts of which are now in the Spruced Up Bed) became the mountains and the cow yard was my pretend desert range full of cactus, especially in late summer when the bull thistles grew to amazing, towering heights (hey, I was a goofy kid, ok?) Trigger and I would ride around the 'cacti' and pretend we were rounding up cattle. The Holsteins obliged me rather grudgingly on their slow plod from the pasture to the barn for evening milking, calmly chewing their cud and swishing their tails as Trigger and I brought up the rear. Everyone knows that on TV an approaching horse makes distinctive Clip-Clop sounds, it's a given, even if the horse is walking on a Mattress of Marshmallows he will still make a clip-clop noise. I lacked sound effects. And I also lacked the appropriate tracks in the soft ground. Who ever heard of a horse leaving tennis shoe prints in the sand? Since my dad had farmed with work horses before he owned a tractor, we had a few heavy horseshoes lying around in his shop. I had a brilliant idea. If I could simply affix these horseshoes to my feet, er... Trigger's hooves, then I could make tracks that would look just like a horse. Monty Python had that problem too...when the movie was made they found they didn't have enough money in the budget to use real horses. So, they improvised by pretending to ride imaginary horses complete with holding the 'reins' at just the right angle and walking in a manner suggestive of being on horseback. (I had that step down COLD, I'm really good at it, even now, I practice it occasionally when I'm walking at night in the dark.) And each Knight had a porter equipped with a pair of coconut shells that he clapped together producing the lovely Clip Clop sound. When I watched the movie I was thinking, "Oh, why didn't I ever think of that?" but then I would have needed two more spare hands somewhere to hold the coconuts, so I guess it wouldn't have worked anyway. I had resorted to making the clop noises with my tongue. Wait, where were we? Oh, yes... So, the trusty binder twine came into play one more time and I rigged up a system where I tied the huge horse shoes to my little feet in the most professional system a six year old can come up with. I remember the first time I tried walking in the huge horseshoes wasn't real comfortable since my foot was perched on the very edge of the front of the shoe and the twine kept slipping, but I walked slowly down the concrete barn alley and there it was, the Coveted Clopping Sound. I was thrilled! But everyone knows Trigger has to gallop, and that's where I ran into a few technical difficulties. The binder twine didn't bind the shoes to my feet very well and as soon as Trigger edged into a full-blown canter the shoes came loose and did some seriously painful damage to Trigger's shins. I can remember that noise to this day, the dull THUD of the iron horseshoe clunking off my legs and the instant screeching halt to fix my exceedingly painful wardrobe malfunction. I still have lumps on my shins; I often wonder if it's from those early days of horseplay? My mother was at her wit's end with me and my legs anyway. I was such a tomboy/horse/farm kid and I lived in shorts in the summertime and if I wasn't clacking my shins with heavy horse shoes, I was crawling around in the haymow leaving red scratches and welts or one time, cantering full-speed down our gravel barn hill only to trip and fall headlong down the hill, embedding half of a load of gravel in my knee caps and shins. You know how when you fall or accidentally bash your finger with a hammer and right before the pain sets in there's that split second of realization, "Oh, this is going to leave a mark?" Well, it didn't feel good, either. And when it came time for church on Sunday there was Karen with her band-aided knobby knees and scratched, bruised and scabby legs in her little dress and proper white anklets and saddle shoes. Oh, Saddle Shoes...remember them, white with the black middle? Anyway. Mom wasn't proud to take me to church looking like a child abuse victim and she used to chide me all the time on my awful legs. If I could have had my way, I would have wrapped them up in scraps of white sheets like they did with racehorses and then I would have looked Stunning but she wouldn't let me go out in public that way. Moms are like that. All good things have to come to an end and sadly, Trigger did, too. He met with foul play when my efforts to rein him in ended rather badly over two year's worth of hard trail rides and his head fell off. I was devastated. Truly, I was. I killed Trigger. We had some duct tape and many repairs were made, but eventually he just couldn't keep his head about him anymore. I was so sad. And then, my father bought me a Shetland pony when I was seven. Sad to say, though the pony was an amazing gift (and I know I sound so spoiled here, but trust me, my childhood was not about indulgence) the pony (Prince) absolutely detested me. I much preferred riding Trigger to the Real Thing but Dad got angry when he saw me still playing with the fool toy and that ended my pretend-horse days. Isn't that the way life goes sometimes? Better watch what you wish for, you might get it. But that's a post for another day. Fast forward almost 50 years and here we are again. Two or three times a week after dark Carl and I need to go to town (a little town of 3,000 people) for groceries or gasoline or whatever, and after we get done shopping, I leave Carl to pay for the food and I head for the sidewalk on Main Street and walk towards home. When Carl gets done at the store, he usually heads for the gas station to fill up, so I have about twenty minutes to get as far as I can. It's slightly uphill and I really huff and puff trying to beat my previous record from the time before. Walking in town at night is really different and the time goes fast. I kinda enjoy it, except last night a lady had let her tiny Shih Tzu puppy out to pee off leash and when it spotted me I was under attack again, ha. I must have been a Dog Magnet/Chew Toy in a previous life. Lucky for me it was a Shih Tzu, not a Pit Bull. No damage done to me or the little doggy, just a very startled lady who wasn't expecting a pedestrian to be strolling by that time of night. Maybe the dogs are attracted to my silly walk? I imagine I still retain a bit of the Trigger Step to this day. And that could be the reason I made another couple uneasy last week on another one of my walks through town. Carl and I had been working on the Spruced Up Bed and ran out of gasoline for the chainsaw and lawnmowers so we headed to town after dark, like usual. While he pumped gas, I set out from the gas station on a side street headed for Main Street. Just as I got to the corner, another couple walking a large retriever-type dog were approaching, so I let them go first, since I didn't want to antagonize their pet. There are street lights in town, albeit a bit dim, and I did sort of hang back a little. I could tell they were aware of me, though they didn't acknowledge my presence. And, as it turns out, they were also wary of me. I waited until they were about a hundred feet up the sidewalk and then resumed my walk. They were going at a good pace, so I thought, well, we're not walking together, per se, but I have some companionship anyway until Carl catches up with me. He had five gas cans and his car to fill up, so he was going to be awhile. I followed along at distance behind the couple with the big dog and all was well until the lady turned around and noticed I was walking behind them. I couldn't make out what she said to her companion due to the distance, but he then turned around and glanced behind him, too. They started walking much faster. So then I did, too...but they kept looking over their shoulders.....what are they looking at? They seemed a bit frightened. I didn't see anything. So, I shrugged and resumed my walk. Then their dog decided he wanted to mark his territory on a fire hydrant, and they had to come to a halt. I slowed down, too, to give them some room, but the lady yanked at the dog's leash and ordered him to 'Come!' and glancing back nervously again, she and her ill at ease companion redoubled their efforts to make up for the lost time and space we had between us. I heard her say, "That person is still coming right behind us." By this time they were all but jogging down the street in front of me and the poor dog didn't get a chance to pee on anything. That's when I realized I was what they were afraid of. They were walking a very large dog, there were two of them, and there were street lights, but they were afraid of me. I had to share this funny situation with someone, so I called Ann on my cellphone since it was 9PM and she was on break at her job. I described what was going on between my huffs and puffs walking uphill and she said, "Are you still wearing your kneepads? How about your sweatband? And do you have your loppers in the holster yet?" I almost stopped dead in my tracks......let's see, nope, I took my knee pads off and my sweatband was in Carl's car, but I did have my Felco on my hip and my hair was sticking up all over like a deranged windstorm had styled it. I'm a big girl, so I suppose the poor couple was terrified thinking a Middle-Aged Woman with a Pruner in her Pocket was going to do them great bodily harm. I started to giggle which greatly cut down on my forward speed. The couple was almost out of sight by now, they were really beating a hasty retreat. Yet another quote from the movie: "Run AWAY!! RUN AWAY!" Ann had to go back to work and I resumed my walk, clip clopping down the sidewalk until Carl came to pick me up. I imagine that incites some curiosity around town too, who is this strange old woman with the Silly Walk who gets picked up on Main Street by a man in a car with no muffler? The weekend is over. I was just looking online for news reports of Hurricane Irene and hope everyone affected by the storm came through unharmed. Living here in the Rust Belt, we have never experienced a hurricane and I don't feel slighted in the least. The occasional tornado is enough madness and mayhem for us. So, the weekend in review, let's see. Well, Carl and I worked on the Rock Grove (Toni over at Signature Gardens had a better name for this project 'Spruced Up Garden') and if it turns out to be a place of beauty, I think we'll have a new name for the area. Thank you, Toni! The jury is out on whether it was an improvement over what we had before, but we needed to find a place to put all the field stone. We both liked the idea of mimicking the stone walls found along pastures up near Waupaca where you can almost walk across an acre of land and never touch the ground for all the rocks. I've just backed down the ramp and am starting to back around the circle. Thank goodness all the plants have been taken out on the left side so I have a place to put that big wheel. The target? That black rock. Though it doesn't look all that big, it's a heavy beast. Ok, all forked up and ready to go. I've been driving this particular tractor since I was 14 years old and it's like driving a car to me. I never had to drive a forklift before we started building the Quarry, but I think I could get a job as a forklift operator now. I've had TONS of practice, lol. Going forward now, headed back to the ramp. Here's the tricky part, keep the rock on the forklift teeth, the tractor out of the shrubbery and for heaven's sakes, don't knock down the stone wall on the left (you can't see it, but I can) and make the very sharp turn at the top of the ramp all the while remembering there's only 10' between the Formal Garden and Quarry. With round rocks on the forklift, I normally backed out of the garden or we were forever retrieving rocks that rolled down the ramp after they fell off the tractor. This was a flat one, so I opted to drive the tractor out. Carl was taking these pictures and I'm surprised he didn't fling the camera and make sure I wasn't taking out hours and hours of the work he did on that wall last weekend. He trusts me. Silly man. Ok, out of the Formal Garden and dead ahead is the drop off for the Quarry pond. Turn too short and take out the big rock and Dwarf Alberta Spruce, not to mention the sedums. Hmmmmm....this is a head-scratcher. Calls for some backing up and going ahead to get re-situated. Ok, here we go...poor lawn isn't liking this very much, is it? Watch the tree on the left and the hosta on the right. Figures, that hosta is 'Liberty' and the prettiest one we own, and look at it now....half the plant it used to be after all these trips through here with the equipment. Approaching the next bend. The bad part of being up a little higher on a tractor seat is you can see more work that needs doing. Phooey. There, success at last, almost out of the woods and then headed all the way down the lane and around the corner to the other side of the yard. Ok, now we're on the Pachyberm side and I'm backing this ol' rock back into the trees. Care to join me? It's great fun, the branches are nice and picky and the needles fall off and go down my shirt into areas really not suitable for polite discussion. Uh, Carl?? He needed to put the camera down to come and hold up some of the limbs with a shovel so the tractor's muffler didn't get ripped off. So, that, in a nutshell is how we moved the rocks out of the Formal Garden to the Rock Grove. Just repeat the above steps 203 times. We worked until dark forced us to quit and then had another bonfire with the day's branches. As we sat around the campfire until nearly midnight we got to rethinking this job. Was it necessary? No. But Reason #1, we wanted to move the rocks to downsize the Formal Garden. And Reason #2 for this fiasco: a bunch of dead limbs in the spruce trees weren't pretty to look at. Of course, we could have solved the problem by just not walking through that part of the yard, but I kinda messed that up when I insisted on the Something Else bed last fall and made it part of the Tour. And a very uninspiring part it was/is. Carl wasn't as reluctant to work on this project as he was the Something Else bed the year before, though. I could tell by his lack of growling. I wish I'd taken a picture of all the branches we cut down this past weekend, it looked as if good ol' Irene took a detour to our backyard for the loads and loads of dead branches we hauled out and burned. I keep a trusty Felco pruners in a holster on my hip at all times and it was in constant use in my down time while I was waiting for Carl to perfect the placement of each stone. But then there were branches that my Felco and I weren't capable of hacking through, so I went and got the big loppers out of the barn. Ok, now we'll get somewhere. And I did, with many of them. But the spruce branches have been dead for so long and yet are so unbelievably tough; I'm huffing and puffing and yes, swearing at times ( I know, shame, shame) but really, when you're an ample-bosomed 53- year old woman and the loppers you're trying so hard to close around a branch five feet overhead suddenly DO close with a resounding whack and you find your ample bosomage stuck between the handles, well, let's say it's not a Hallmark Moment. Carl was constantly scolding me not to try so hard, "You're going to hurt yourself." "No, I think I already done did," I said through clenched teeth as I tried to stop my eyes from watering. With a masculine sigh he took over and tried to hurt himself, too, so then I'd scold him. (Don't we sound like fun to work with?) Two middle-aged idiots wrestling with rocks and spruce branches creating another mess we'll have to deal with. Randy from Randy and Meg's Garden Paradise questioned in my comment section last Friday with just one word, "Downsizing??" Heh, heh, yes, Randy, you're right, see it's the menfolk out there who have the Voice of Reason. They know work when they see it. You can't pull the wool over their eyes. Even the young men aren't fooled by my declarations of "This area won't need maintenance once we're done, see it's just too shady in here for the weeds to grow." Joel was home for awhile on Saturday afternoon and strolled over to where we were working and was alarmed when he saw his Maternal Unit dangling from a tree branch by a loppers after my foot slipped off the rickety ladder I was perched on. "What are you doing?" he chided. "OH, for cryin' out loud," he said as he pried my terrified hands off the handles of the loppers and saw me back to safety on solid ground again. He took pity on his elders and went to the garage and fired up the Stihl. The chainsaw made quick work of many of the branches, but he was reluctant to take too many off, especially if there was still needles on the outermost limbs. After all, you can take a branch off any time, but they are beastly hard to put back on the tree. So we took the Go Slow Approach. Even at that, we had another three trailer-loads of branches to haul out and burn on Saturday night. This is such a big change for the area and totally blows the cover of the Formal Garden, too. And if we take too many limbs off I imagine the menfolk are right, There Will Be Weeds. And you know what else? There Will Be Visitors. We had lots of visitors on Saturday, three carloads worth, and a few drive-bys that sat on the road and took pictures. (I like to think they were enjoying the view of my flowers, but it could have been they were trying to catch a glimpse of the two Idiotic Gardeners. We could see the cars on the road perfectly from our cover in the Spruced Up Garden. But they couldn't see us. See, there's the road and wait............what's this?? Hey, this car decided the gardens are too far away from the road! Ok, I'll let you in on it.......our last visitors had just left and I was retrieving yet another rock from the Formal Garden when Joel came to take the tractor from me, "Dad says Mrs. M is here with her granddaughter and she's waiting in her car for you." "Mrs. M" is a wonderful lady who is nearly 90 years old and who has been coming out to see the gardens several times a year for as long as I can remember. She gave me a gorgeous white bleeding heart that I have growing in several different places in the gardens and every time I see that plant, I think of her fondly. Mrs. M is very much like my other devoted garden visitor, Geraldine, who passed away last year. Sadly, Mrs. M has had a bad patch of health, this spring she suffered a stroke which left her paralyzed on her right side. She's doing much better than the last time I saw her and hopes to get out of the nursing home and into assisted living, and when she gets someone to drive her car, she usually shows them the way to our garden. I met her granddaughter who was in Carl's clutches in mid-tour on my way to the driveway to see Mrs. M.
I greeted her warmly and asked about her health. She was looking almost radiant, and I told her so. Then I asked her if she'd like to see the garden, and she sighed, "Oh, I would, but I have to use a wheelchair, and well, that's such a bother, and really, it's fine, I've seen your gardens before. I remember how they look.......," she trailed off, looking sadly out the window at my gravel. "Do you mind if I drive your car?" I asked. "We can take an Auto Tour, c'mon, it will be fun!" "Oh, my goodness, no, that's not necessary!" she said, and then she peered at me closely to see if I'd lost my mind. "Well......are you sure it's ok?" I drove Mrs. M all over the yard and we talked about the flowers for a long time. I think her granddaughter was a little startled to see her grandmother's car running around on the lawn, but Carl assured her Mrs. M would be fine. After we toured the garden, I drove her down the lane to the Back Eight and we saw the sights out there in the White Pines. Mrs. M said she enjoyed the little ride. She is such a wonderful friend and I hope to see her soon. Sunday was a repeat of Saturday except I had a baby shower to attend in the afternoon. When I got home, it was time to get out of the good clothes and into the rags again and back to work. This was the last rock we tried to move late Sunday night, but it got so dark out, we had to quit. It was time to haul the branches we'd cut down yet again for burning. Carl asked me to go get the trailer to load them up, and then we both remembered, there is no trailer here, Joel had gone kayaking on Sunday and had it with him. So, we had to carry all the branches over the bridge and to the fire. Oooops, Messy Bridge, isn't it? Hey, it was dark last night. That's my defense. Here's what the Formal Garden looks like now after all the rocks are out. Now 'all' Carl has to do is finish putting in the new walls. Well, Ok, I lied. There is still ONE more rock down there. I don't know how we overlooked this big boy.
. This silly building needs a roof of some sort. Needs some work. See all the spots where limbs once were on the spruce trees? Oh, my aching boo....I mean arms, lol. The wine might give us the incentive to finish up all the projects or maybe after a few more glasses, we won't care any more about rock moving or limb whacking or Gardening At All! Bring on the Wine-Bearing Tour Group---my ash is starting to drag. I don't know where the week went. For that matter, I don't know where the summer went, either. I remember being a little kid and trying to be patient while waiting for something special like my birthday or for the clock when I was back in grade school to hit 3 PM and time seemed to stand still. Mom always said time would go faster as I grew older. Mom was right. It just zips by, doesn't it? What probably had me so confused as to where the time went this week in particular was the fact that Carl was able to take a half-day vacation on Tuesday and all day Wednesday. This was great; we managed to get some work done on the stone walls, but both of us are goofed up as to what day we're on. It sort of feels like it should be Tuesday, but over at Tootsie's she's celebrating Fertilizer Friday! I want to show pretty pictures of all the stuff still blooming, but first I want to show you the progress on the rock removal and rebuilding project. It's not pretty, but here goes: We had limbed up all those dead spruce branches last Saturday and then on Monday evening Joel and his girlfriend, Allison, worked on moving more of the rocks out from the Formal Garden to the....uh.......I don't have a name for where the rocks went. Well, that poses a problem, doesn't it? And another problem is we don't want or need another area to weed, good gracious no, we're trying to downsize, so if I put a name on this area, will I have to maintain it? The weird thing is, if I don't name it, then we will all have problems knowing where in the yard something is located, such as, "Where is the green shovel?" or "Has anyone seen the lawn mower?" or "When was the last time anyone saw Grandma Lucille?" "Go look in the Quarry," or "Did you check the Woodland Bed?" There's Mom aka The Elusive Lucille, cutting down the daylily stalks this afternoon and no, she did not realize I had a camera or one of two things would have happened: I'd be taking pictures of her quickly retreating back or she'd throw her trowel at me. Anyway, ok, a name for where the rocks are going..... Well, the trees we limbed up are blue spruce; botanical name being Picea Pungens due to their poky needles. The good botanists who named them were right about that; I've been picking very sharp, dead needles out of my knee caps (even through my knee pads) several times over the last week. Carl suggested we call it the 'Cathedral of Pines' Well, that's a bit too classy for me (and not to be a nit-picker, but they're not pine trees.) Our naming system around here is very descriptive; we have the Pachyberm (named because it looks like an elephant burial mound) and the Something Else Bed ( named because I had spare rocks and needed something else to do with them) the River Bed (because it's crooked and winds around like a river) well, you get the idea. So, let's see, it's a grove of spruce trees and there's rocks. Ok, until something better comes along I'm dubbing this newest piece o' work, The Rock Grove. There, that's done. Took me much less time to name it something than it's taking us to throw the rocks in place, didn't it? There was a report of a weak tornado with this storm which stayed about ten miles to the north of us. The storm uprooted some trees and did some damage to buildings where it was the worst. We gained 3/4 of an inch of rain from another quick storm that passed through, the first rain we've had since the beginning of August. We appreciated every drop of it, too, though when we got caught in the rain on the way home, I was down to 15 mph since the rain was just pounding. That was the end of Tuesday's work. Wednesday dawned bright and sunny, time to get back to throwing rocks around again. But then we encountered technical difficulties; some of the rocks were much too big for Joel's tractor, so we had to switch to the 574 but the forklift teeth were too far apart to pick up the round stones we're working with so Carl is going to weld up something new for the forklift. In the meantime we worked with the rocks Joel and Allison had retrieved earlier since some of them are small enough we can use the hand cart. Nearing sunset Thursday night, here's as far as we've gotten with the job. And to make matters worse, we really don't know what we're doing with these rocks. There's no rhyme or reason to it, just a random wall plopped where the sun don't shine. Nothing grows in the Rock Grove, it's too dark. And I hope it stays that way, yes, we did limb up a lot of branches but they were all dead limbs, so hopefully it's still dark enough in there that nothing wants to grow except moss on the granite. The funny-looking orange patches are from the sun setting to the west casting the last light of the day into the area. It is interesting how the garden looks different from this direction, these are views we haven't seen in over twenty years. So, there you have it, the progress so far on the Rock Grove. 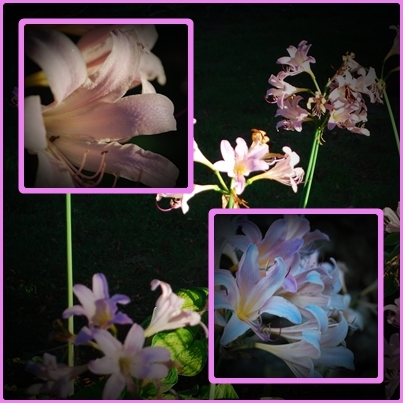 The Surprise Lilies are shocking everyone with their abrupt appearance. I was really glad to see their blooms since I moved over 200 of them last fall and had hoped I didn't get them planted too late. Did I ever tell you how these came to be in our garden? Years ago we were at our local landfill where we always poked around looking for rocks for walls and I came upon a pile of huge bulbs. Someone had apparently dug them up and dumped them. I didn't know what they were but they looked interesting, so me being me, I yelled for Joel and Dave (yes, we took the boys to the dump when they were little, weren't we good parents?) and they helped load them into two five gallon pails. I brought them home and happily planted the big bulbs all over the place and then promptly forgot I had. In the spring, these huge strap-like leaves came up and we were all excited, wow, what's the flower going to look like if the leaves are that big?! And then, nothing happened. No flower. I was really sad and figured that was why their previous owners had tossed them out. Who needs a bunch of green leaves with no flowers? Stupid bulbs. Phooey, that was a waste of time. But then in August these bizarre stems started popping up all over the place and I was confused again....what in the world are these things? Then when they bloomed, oh, I was hooked and overjoyed we'd brought them home from the dump. Lycoris Squamigera---weird name, weird plant, beautiful flower. Moving on, have you ever been in a Big Box Store and gotten hooked on the bulbs and tubers they often tempt you with in those flashy colored cardboard boxes? You tell yourself, "Self, you know as a gardener that these bulbs are going to be all dried up and inferior and probably not even the same color (or species) pictured on the box," but there's still snow on the ground outside and the picture is so impossibly pretty and you cave in and buy the silly box of dried up roots anyway? Ok, so maybe I'm the only one to do such silly things, but I took a chance on a box of 'Pink Miniature Dahlias' (that's the name on the box) and boy, they were really tiny and shriveled up, but I stuck them in the ground anyway and gave them their last rites. They really looked dead. But I was wrong. I had forgotten all about them until they popped up in June and even though some bug or other is having a field day chewing on them and they're planted in too much shade, they are making me smile and I don't even know their name. Apparently they impressed Joel, too, who took some much better pictures of them than I did. 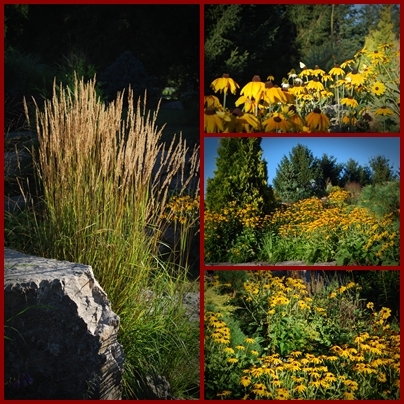 Rudbeckias......still going strong, and now the ornamental grasses are starting to really do their thing, too. All summer long the grasses are a presence, but I think fall and winter is their best season, especially when the shadows get long in the evening. The rest of the flowers in the River Bed are in shadow, but the grasses light up the background. The grasses really stand out in the sunlight, don't they? The trumpet vine is still tooting along really well. It can be invasive, sending up shoots from the roots, but I'll put up with it's enthusiasm as long as it flowers for months on end the way it does. Coneflowers looking a bit tired, but the butterflies aren't offended. Love the seedheads on the 'Jester' millet. Echinacea 'Virgin' stuffed in between a 'Sunkist' arborvitae and a Weeping Norway Spruce. Joel can make even the lowly petunia look great. Why does everyone pick on petunias? C'mon now, they are still blooming, aren't they? Any plant that puts out as many blooms as they do gets my respect. 'Little Bunny' miscanthus showing off in the sun. Silver grass just starting to show the silver. Who'd think a spiderweb could look so much like a flower? Well, this was way too long of a post, I got carried away again. Don't forget to visit Tootsie and see gorgeous gardens from all over the world!